What Makes a Good Monitor Well? 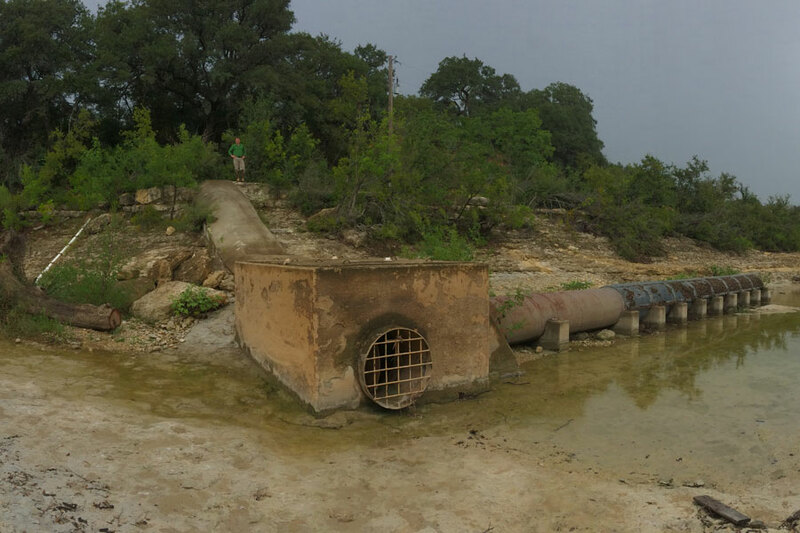 Aquifer conditions are dynamic and therefore water levels can fluctuate because of drought, recharge, and pumping. 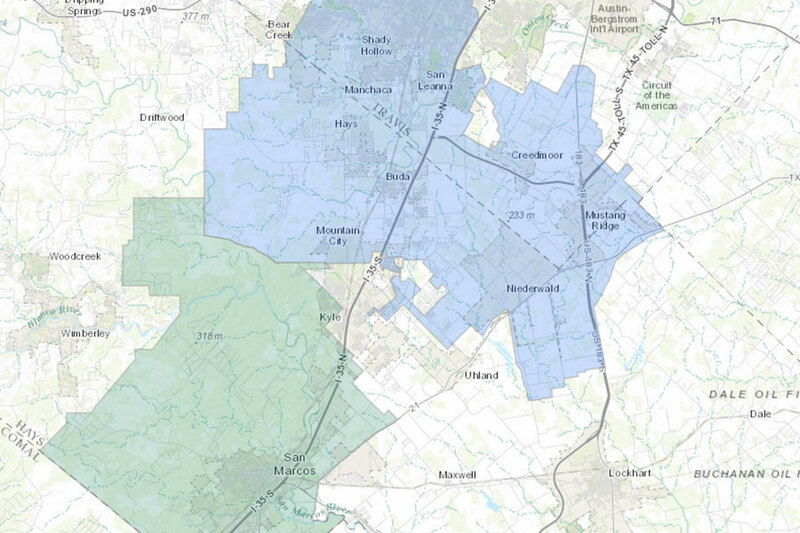 Monitor wells help track these changes and inform policy to help protect water supplies and springflow for all users. 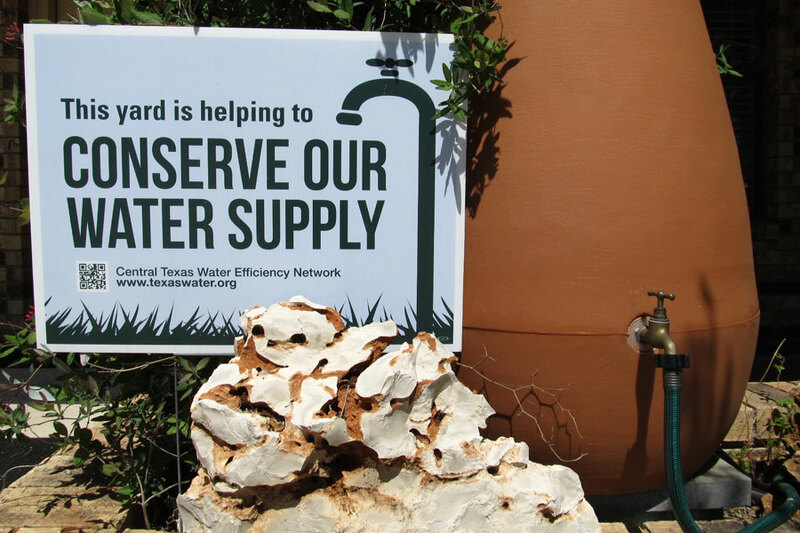 After all, groundwater is a shared resource. We often get asked the question, what makes a good monitor well? In short, the answer is that a well that is representative of the aquifer we are interested in. But, while water levels can be measured in most wells, the nature of the geology and well construction usually limits the potential for a well to be used for monitoring purposes. At the surface, groundwater wells can appear similar, however individual wells–even neighboring ones–can be constructed in very different ways. For example, different depths of wells, or different depths of the casing influences production rates and water quality. Well records (e.g. driller’s logs, geophysical logs, video logs) are key to understanding a well’s construction. Drillers use a variety of construction methods to balance sufficient quantity (yield) with good (a relative term) water quality. The Edwards and Trinity Aquifers are each made up of many layers of rock. Water quantity and quality can vary from layer to layer. The location and depth of a well, and how it is constructed, determine what rock units that well can access and therefore influence its yield and quality. The construction of a well such as its casing depth, amount of cement, and/or packers can seal off undesirable layers. At the same time, the well is left open or screened at selected intervals to allow water to enter the well at the desired layers. Every well should have a driller’s log that documents well depth, well construction, pump setting, and an initial water level. In 2003, all well drillers were required to submit this information online, so data on wells drilled in the last 12 years is much more accessible. 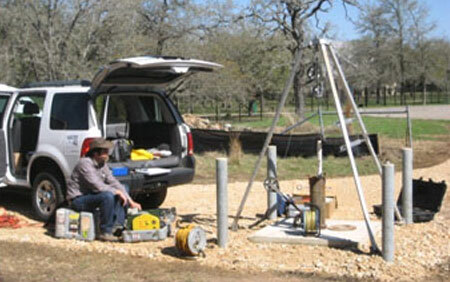 In sensitive areas, a more detailed geophysical log is often required to inform the well construction and to limit the mixing of undesirable waters between aquifers (and into the well). 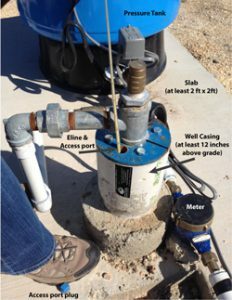 On the top of the well (called well head), most contain a 1/2″ or 3/4″ hole that can allows the measurement of the water level in the well (also called an observation port). To prevent debris or contaminants from entering the well, this port is usually plugged by a blue plastic square-head nut. The water level can be measured through that port using either an eline (electric measuring tape; reliable but time-consuming) or a sonic meter (bounces a sound wave off water surface; fast but requires verification). 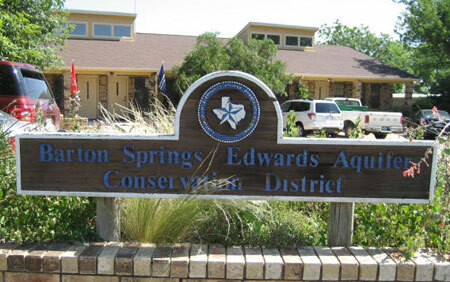 District staff maintain over 30 continuous water level monitoring sites in the Edwards and Trinity aquifers. Many of the wells are domestic wells that are in use. 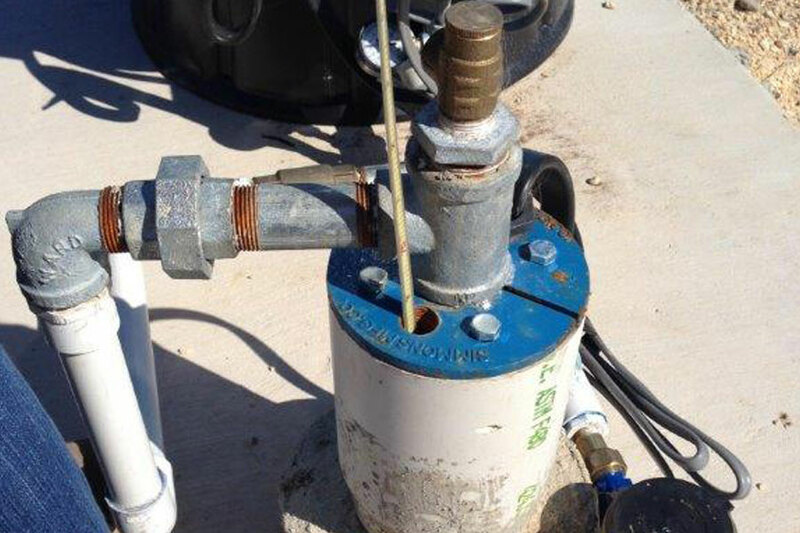 These sites are equipped with a probe (a pressure transducer) that is programmed to measure the water level hourly. Staff stop by to download the data about once a quarter, or more frequently for a specific study. 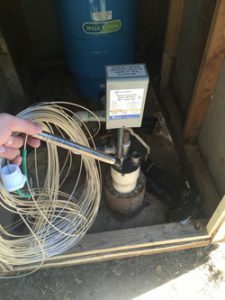 These monitoring wells are plumbed with a drop pipe that keeps the pressure transducer and cable away from the pipe that brings water to the surface and the pump wires. Monitoring does not interfere with operation of the well. 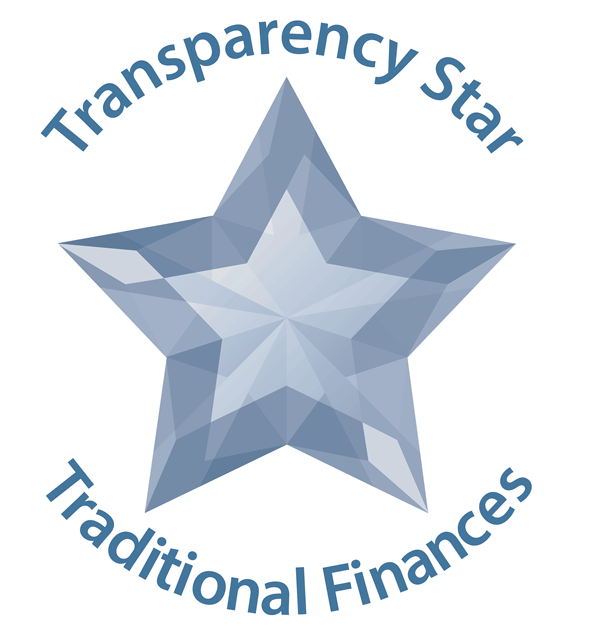 Everyone benefits from an efficient monitoring network. Optimal monitor wells are representative of the aquifer and area we are interested in learning about. Monitor wells need good construction information (logs) and must be readily accessible. Many thanks to all of the well owners who allow this essential access to water level data, respond to conservation requests, and responsibly use and maintain their wells. We are all in this together.